Distributed Art Publishers (DAP), 9781935202226, 1pp. 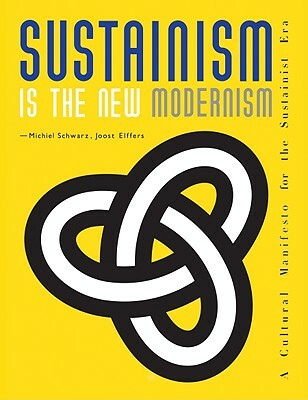 Michiel Schwarz and Joost Elffers' Sustainism Is the New Modernism declares the dawn of a new cultural era, as we transition from modernity to sustainity--towards a world that is more connected, more localist, more digital and more sustainable. As the authors of this clear-eyed manifesto argue, "sustainism marks a shift not only in thinking and doing but in collective perception--of how we live, do business, feed ourselves, design, travel and communicate, as much as how we deal with nature." In the twentieth century, whether we knew it or not, our world was shaped by modernist values, from the design of our cities to our homes, technologies and our conceptions of progress. Sustainism recasts our relationship to all of these things, binding ecological issues to a larger picture of our world. Through a series of graphically dynamic aphorisms, quotes and symbols designed for worldwide use by businesses, individuals and institutions, to signal support for sustainism, Michiel Schwarz and Joost Elffers show how the movement is already reshaping global culture, technology, food and media. With this concise manifesto, they launch the term sustainism into the public consciousness. The sustainist era has begun. Michiel Schwarz is a Dutch independent cultural thinker, innovator and producer, now working from Berkeley, California. Originally trained as a sociologist of technology, he has initiated projects on global issues, the future of design, technology and media. His publications include The Technological Culture and Speed: Visions of an Accelerated Age. Joost Elffers is a designer, "symbol maker" and creative producer of award-winning and innovative books such as 48 Laws of Power, Play With Your Food and Tangram: The Ancient Chinese Shapes Game.